Discover our ancient Wine Cellar – opening for the first time this Notte Bianca, 2018! Valletta is boasting with character in its infrastructure and longstanding buildings. There is a story in every stone and our history was created behind the walls of the city. At Ta’ Rinaldu, we have our own historic walls, boasting with character and roaming with the sound of the past centuries. At the heart of Merchant’s street, our ancient wine cellar is an experience worth discovering – an intimate room made for great encounters and pleasant memories. Its history has been lost through generations, but word has it was a loved family home. 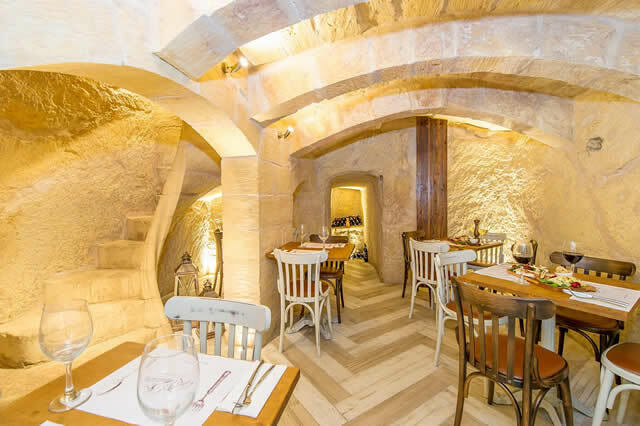 Accessible through a 400-year-old narrow limestone staircase, our wine cellar’s characteristics makes it more mystic and its surroundings intimate with its small caverns. Our authentic wine cellar offers an exquisite wine collection paired off with mouth-watering gourmet foods. One can pair off a good bottle of Chianti with our gorgeously prepared platters. Choose from our contemporary selection of platters ranging from Maltese delicacies to Italian cold cuts and more. Enjoy the spirit of our Capital of Culture 2018, Valletta by dining in the walls of a house who made our Capital City what it is today. Our wine cellar will be open as from the eve of Notte Bianca 2018. Call us on 27456677 to reserve your table. If you have any special requirement, feel free to enquire with our friendly servers who will be more than happy to assist you. We look forward to see you at Ta Rinaldu. L-ikla t-tajba!